After the recent launch of fifth generation Moto G5 and G5 Plus, Lenovo is touted to be coming up with the brand's most affordable handsets ever. The Moto C and C Plus devices are allegedly targeted at first-time smartphone buyers in the budget range. Both the smartphones are tipped to feature 5-inch displays with Android 7.0 Nougat. Moto C is set to be offered in two options of 3G and 4G variants, while Moto C Plus would be a 4G LTE-capable device. Both of the Moto smartphones have been said to sport quad-core MediaTek processors. The 3G variant of Moto C is expected to come with a 32-bit processor clocked at 1.3 GHz while the Moto C Plus will reportedly feature 64-bit version with the same clock speed. The 4G variant of Moto C has been suggested to come with 64-bit architecture clocking a speed of 1.1 GHz. Furthermore Moto C would feature an FWVGA screen resolution at 480 x 854 pixels with a 2350 mAh battery. The storage capacity would either be 8 GB or 16 GB depending on the region configurations and cellular modem. On the same note Moto C Plus would sport an HD screen resolution at 720 x 1280 pixels with a large 4000 mAh battery. The built-in storage on offer would be 16 GB. Both the variants are expected to come with expandable storage via microSD card. On the photography front, Moto C features a 5-megapixel rear camera with flash (fixed-focus on 3G, auto-focus with 4G), along with a 2-megapixel selfie snapper, which also sports a flash. 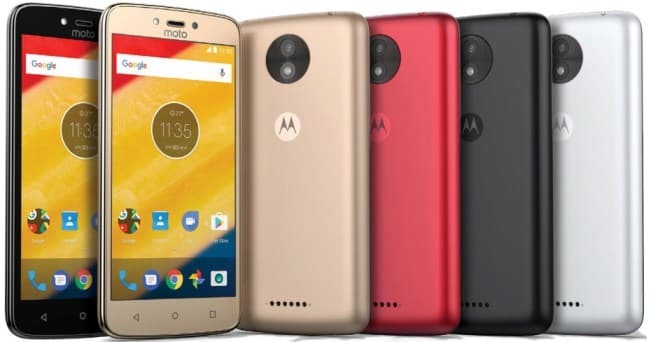 The front-facing camera configuration remains the same for Moto C Plus albeit sporting an increase in the main image sensor’s resolution to 8 megapixels. The pair would retail in a variety of colors as Black, White, Gold, and Red.